Hello, #Bond_age_Pod listeners. We’ve been spewing forth our Bond prattle for two years now and quite frankly I don’t know why you haven’t put us on mute… especially after my tirade on the SPECTRE episode. I know we said we were going to revisit SPECTRE with clearer heads but first I want to do something new with the #Bond_age_Pod. We want to hear you. And not just your Twatter bag tweets. In this wondrous age of digital advancement, you can all appear on the next #Bond_age_Pod. For this very special episode I’m going to combine two of my favorite things, Seinfeld and James Bond, into one blissful aural cacophony. 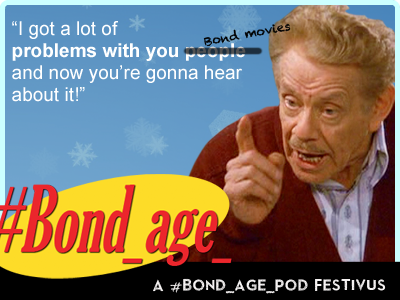 The #Bond_age_Pod Festivus Special will give you all the opportunity to publicly air your grievances — about James Bond, about the #Bond_age_Pod. Hell, in the spirit of Festivus, we’ll take all your tired, crotchety grievances. We’re goddamn giving. Record your Festivus grievance in an audio file. You can use a voice recorder on your smartphone or Garage Band on your Mac or I don’t know what you people do with your PC’s anymore. Introduce yourself: Name, twitter handle, however you want to be identified. State your grievance: Keep it clean-ish. Pick something from the Bond universe that’s always bothered you, hammered at the back of your skull, like pride f’ing with you. Skip the feats of strength: We don’t want to know. 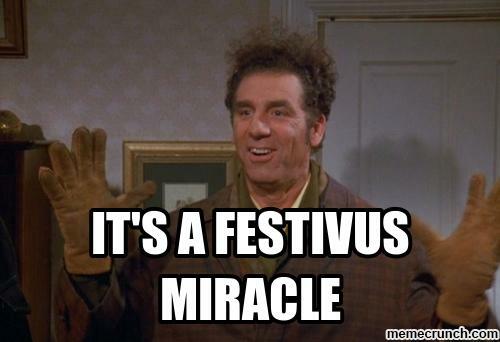 Declare something a Festivus Miracle! Pick out something small or otherwise insignificant from Bond. A tossaway line, a casual moment that might not otherwise be noticed. Praise it! Then declare it a Festivus Miracle! Once you put that recording in the can, send me the audio file at 007hertzrumble@gmail.com. Sound good? You have until the end of the day on Christmas to send me your audio file for inclusion in the episode. I’ll edit the episode and post it sometime before the new year. Let’s rally the #Bond_age_ troops and make this a Festivus worthy of 53 years of James Bond. If you have any questions, feel free to shoot me an email. If you’d like to have a short Skype conversation with one of our hosts instead, we can arrange that in lieu of a solo recording.